One of the tasks I wanted to accomplish in West Yorkshire was to visit and photograph houses and areas where my ancestors had lived. I had a lot of addresses from censuses and certificates, copies of old maps from Rothwell Library, and Google Maps. Of course, many of the old buildings are gone, and streets renamed, re-routed or just plain disappeared. And there’s only so much driving around small villages that three young kids will (quietly) put up with. So it was a case of trying to do as much ground work as possible, before coming up again on my own sometime. My 4 x great grandparents, George and Elizabeth Kemp, were living in Altofts at the time of the 1851 census. Living with them was their four year old son Thomas, and one year old daughter Hannah, as well as a servant, Mary Ramsden (whose occupation is listed as “Nurse”).1 Where I had just a village name for an address, I headed for the local Church of England church and took a snap, which is exactly what I did for Altofts (see yesterday’s post!). 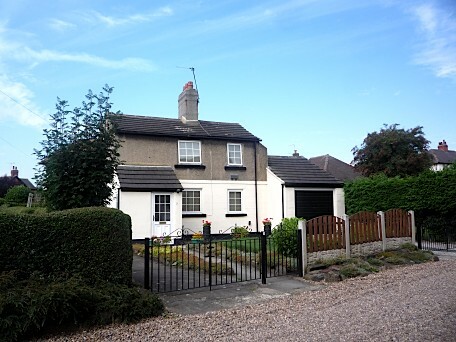 In 1861, their address was “Wellington St, Whitwood” in the parish of Featherstone.2 I found a Wellington St between Castleford and Whitwood Mere, but didn’t think it was the right one, so left it. (Looking at Google maps now, it is possibly the right place, so I need to check this again on a contemporary map.) Thomas and Hannah/Anna are still living with their parents, along with siblings Sophia 9, and Sarah Ann (my 3x great grandmother) 5. Sophia was born in Castleford, and Sarah Ann in Whitwood, so the family had moved around a bit. 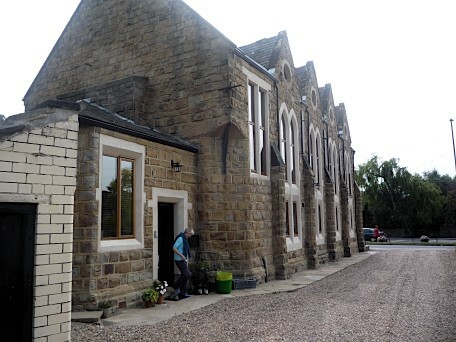 By 1871 they had moved to a “Cottage” in Oulton with Woodlesford.3 On the census, they have been enumerated near to Mill House Flat, though I couldn’t locate this either. Son Tom is the only child left at home, and Elizabeth’s father, James Dickinson, is also living with the family, along with Georgiana Haigh 7 “Adopted child”. Their daughter Sarah Ann had married Alfred Cockerham on December 23, 18715 and in 1881 were also living in Oulton, in Chapel Yard.6 With them were their daughters Mary A. 8, Sophia 5, Alice (my 2x great grandmother) 3, and their one year old son George. Boarding with the family was Thomas Rimmington, Alfred’s (first, once removed) cousin, 72. 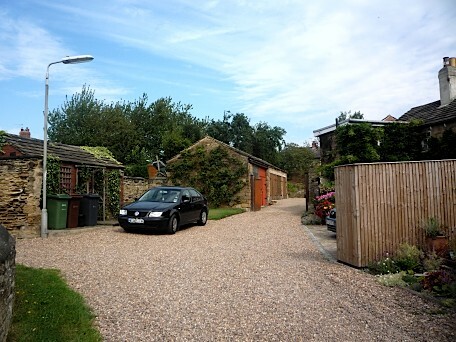 It’s really only a short lane, and down the end are some more cottages and other buildings. 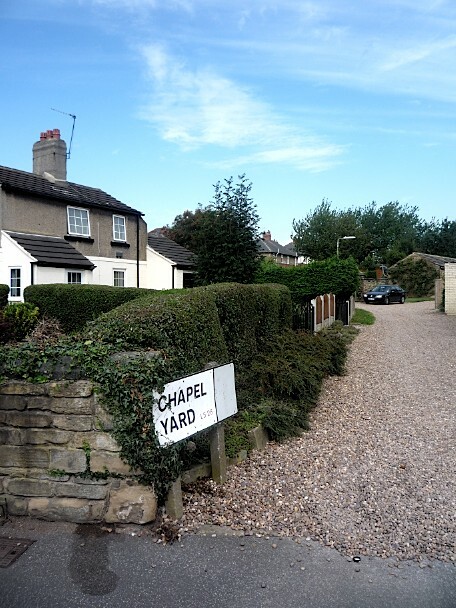 Turning around and going back out to the main street, on the left is the chapel the lane was named after, presumably! “1851 England Census, George Kemp (age 40) household, Altofts, Yorkshire,” Ancestry.com, (http://www.ancestry.co.uk/, accessed 05 Jun 2011), citing PRO HO107/2326, folio 395, p 10, GSU roll: 87562-87564, Wakefield registration district, Bretton sub-registration district, ED 11, household 36, 30 Mar 1851. “1861 England Census, George Kemp (age 50) household, Whitwood, Yorkshire,” Ancestry.com, (http://www.ancestry.co.uk/, accessed 05 Jun 2011), citing PRO RG9/3439, folio 99, p 24, GSU roll: 543132, Pontefract registration district, Pontefract sub-registration district, ED 19, household 99, 07 Apr 1861. “1871 England Census, George Kemp (age 61) household, Oulton with Woodlesford, Yorkshire,” Findmypast, (http://www.findmypast.co.uk/, accessed 10 Jun 2011), citing PRO RG10/4516, folio 68, p 5, Hunslet registration district, Whitkirk sub-registration district, ED 5, household 23, 02 Apr 1871. “1881 England Census, George Kemp (age 71) household, Oulton with Woodlesford, Yorkshire,” Ancestry.com, (http://www.ancestry.co.uk/ : accessed 05 Jun 2011), citing PRO RG11/4493, folio 93, p 7, GSU roll: 1342076, Hunslet registration district, Whitkirk sub-registration district, ED 6, household 36, 03 Apr 1881. England, marriage certificate of Frederick [Alfred] Cockerham and Sarah Ann Kemp; 23 Dec 1871, Wakefield; 1871 Dec [quarter] 09c [vol] 33 [page], General Register Office, Stockport. “1881 England Census, Alfred Cockerham (age 30) household, Oulton with Woodlesford, Yorkshire,” Ancestry.com, (http://www.ancestry.co.uk/ : accessed 06 Jun 2011), citing PRO RG11/4493, folio 94, p 10, GSU roll: 1342076, Hunslet registration district, Whitkirk sub-registration district, ED 6, household 57, 03 Apr 1881. Every Saturday night Randy Seaver sends out a Saturday Night Genealogy Fun challenge at Genea-Musings. Usually I miss out because of the time difference, but this week I thought I’d just post a day late! 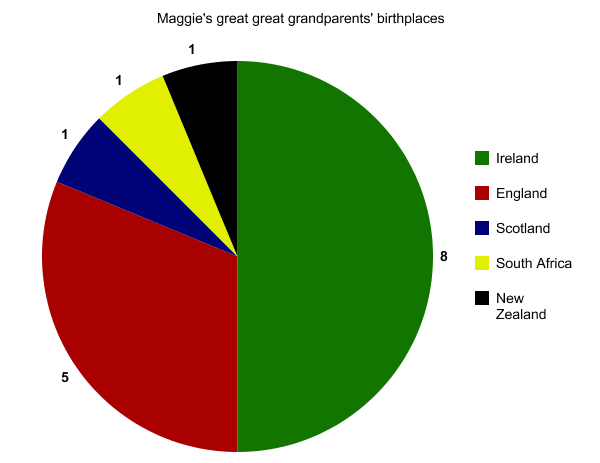 Our mission was to list our 16 great great grandparents, along with their birth, marriage and death dates. Then, determine their birthplaces, and (for extra credit) create a pie chart showing their countries of origin. On 26 Dec 1863 when Michael was 27, he married Margaret BROSNAHAN in the Catholic Chapel, Christchurch, New Zealand. Margaret BROSNAHAN. Born on 8 Dec 1844 in Co Kerry, Ireland. Margaret died at Belper Farm, Main South Road,Temuka, New Zealand, on 16 Aug 1927; she was 82. Buried on 18 Aug 1927 in Temuka Cemetery, Temuka, New Zealand. Bartholomew O’ROURKE. Born abt 1844 in Co Kerry, Ireland. Bartholomew died in Station Street, Napier, New Zealand, on 13 Nov 1923; he was 79. Buried on 15 Nov 1923 in Old Napier Cemetery, New Zealand. Occupation: Carter, Miner. On 2 Sep 1869 when Bartholomew was 25, he married Bridget POWER in the Roman Catholic Church, Charleston, West Coast, New Zealand. Bridget POWER. Born in 1846 in Clonmel, Tipperary, Ireland. Bridget died in Napier, New Zealand, on 18 Jul 1914; she was 68. Buried on 19 Jul 1914 in Old Napier Cemetery, Napier, New Zealand. Martin BURKE. Born in 1840 in Co Mayo, Ireland. Martin died in Nazareth House, Sydenham, NZ, on 27 Nov 1918; he was 78. Buried on 28 Nov 1918 in Sydenham Cemetery, Christchurch, New Zealand. Occupation: Farmer. On 2 Feb 1861 when Martin was 21, he married Ann PHILP in St John’s Catholic Church, Perth, Scotland. Ann PHILP. Born in 1840 in Ceres, Fife, Scotland. Ann died in Burnham, NZ on 13 Mar 1895; she was 55. Buried on 15 Mar 1895 in Darfield Churchyard, Canterbury, New Zealand. John BURTON. Born abt 1826 in Co Tipperary, Ireland. John died in Redwoodtown, Blenheim, New Zealand, on 29 Jun 1897; he was 71. Buried on 30 Jun 1897 in Omaka Cemetery, Marlborough, New Zealand. Occupation: Carter, Labourer. On 17 Jan 1859 when John was 33, he married Bridget MAHONEY in Galbally, Co Limerick, Ireland. Bridget MAHONEY. Born abt 1843 in Galbally, Co Limerick, Ireland. Bridget died in Blenheim, New Zealand, on 22 Nov 1900; she was 57. Buried on 24 Nov 1900 in Omaka Cemetery, Marlborough, New Zealand. Ephraim WRIGHT. Born on 8 Jan 1860 in Polstead, Suffolk, England. Ephraim died in South Eastern Hospital, Deptford, Kent, on 26 Nov 1894; he was 34. Occupation: Labourer, Engine-Fitter. On 13 Mar 1882 when Ephraim was 22, he married Mary Jane CLARK in St Stephen, Lewisham, Kent, England. Mary Jane CLARK. Born abt 1856 in Co Monaghan, Ireland. Mary Jane died in Greenwich, Kent, England, on 12 Feb 1932; she was 76. Occupation: Laundress. Sam NUNNS. Born on 8 Feb 1874 in Rothwell, Yorkshire, England. Sam died in Auckland, New Zealand, on 5 Apr 1945; he was 71. Buried on 4 Oct 1945 in Taruheru Cemetery, Gisborne, New Zealand. Occupation: Borough Employee, Stone Mason (journeyman). 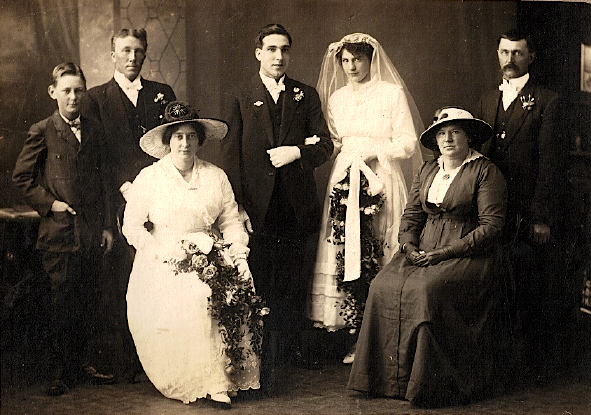 On 11 Jan 1896 when Sam was 21, he married Alice COCKERHAM in Oulton Church, Oulton, Yorkshire, England. Alice COCKERHAM. Born on 9 Mar 1878 in Oulton, Yorkshire, England. Alice died in Gisborne, New Zealand, on 17 Jul 1954; she was 76. Buried on 19 Jul 1954 in Taruheru Cemetery, Gisborne, New Zealand. Michael McGONNELL. Born abt 1840 in Newry, Co Down, Northern Ireland. Michael died in Waiongana, Taranaki, New Zealand, on 5 May 1929; he was 89. Buried on 7 May 1929 in Te Henui Cemetery, New Plymouth, New Zealand. Occupation: Signalman, Farmer, Boatman. On 28 May 1888 when Michael was 48, he married Louisa TUNNECLIFFE in New Plymouth, New Zealand. Louisa TUNNECLIFFE. Born abt 1858 in New Plymouth, New Zealand. Louisa died in Waiongana, Taranaki, on 26 Jun 1926; she was 68. Buried on 29 Jun 1926 in Te Henui Cemetery, New Plymouth, New Zealand. Henry John Forrest FLOREY. Born on 1 Oct 1862 in Pembroke Place, Chatham, Kent, England. Henry John Forrest died in Te Araroa, East Cape, New Zealand, on 5 Oct 1913; he was 51. Buried on 6 Oct 1913 in Te Araroa, East Cape, New Zealand. Occupation: Cook, Tobacconist, Billard Maker. On 10 Mar 1885 when Henry John Forrest was 22, he married Ann Elizabeth (Annie) HORNE in Auckland, New Zealand. Ann Elizabeth (Annie) HORNE. Born abt 1864 in Cape Town, South Africa. Annie died in Newton Road, Auckland, on 9 Mar 1907; she was 43. Buried on 12 Mar 1907 in Remuera, Auckland, New Zealand. 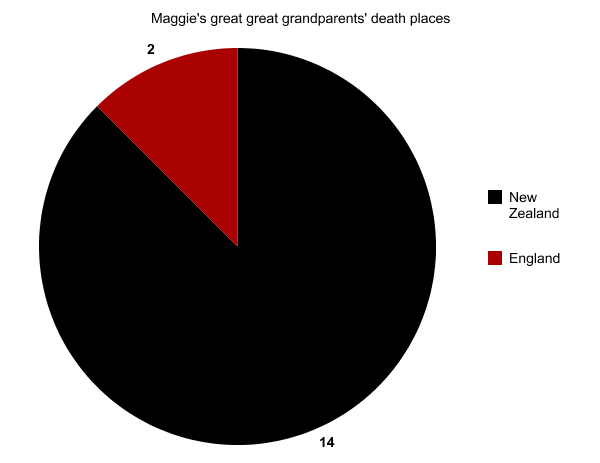 And as an added bonus for readers, here’s a pie chart showing final resting places. Note: Source citations available on request. L > R: ? 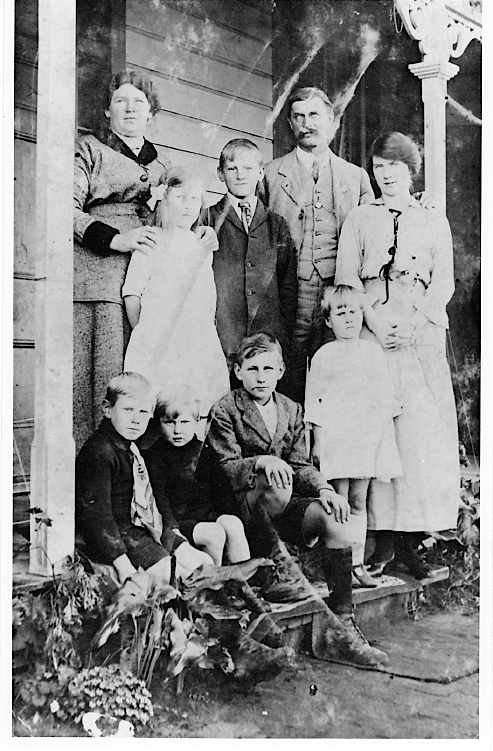 Nunns, Jack Burgess, Violet Nicholson, Alexander Wright, Elsie (Nunns) Wright, Alice (Cockerham) Nunns, Sam Nunns. A returned soldier’s wedding took place at Holy Trinity Church yesterday afternoon, when Corporal Alex Wright, of Gisborne, was married to Miss Elsie Nunns, eldest daughter of Mr S. Nunns, of Gisborne. The bride, who was given away by her father, wore a becoming frock of crepe de chine, with the customary veil and wreath of orange blossoms and carried a shower bouquet. Miss Violet Nicholson, who wore an embroidered voile dress and black velvet hat, and also carried a shower bouquet, was bridesmaid, and Mr J. Burgess attended the bridegroom as best man. The ceremony was performed by the Ven. Archdeacon H. Packe, who afterwards played the wedding march. Subsequently the bridal party repaired to the Trocadero tea rooms, where the wedding breakfast was partaken of. On their arrival there they were greeted by the Poverty Bay orchestra, with appropriate music. Amongst the many beautiful presents received was a handsome three-tier cake from Mr and Mrs Findlay. The usual toasts were proposed and congratulatory speeches were made and the happy couple departed amidst showers of good wishes. Alexander and Elsie are my great grandparents, and married on 7 June 1917 in Gisborne, New Zealand. Wedding Wednesday is an ongoing series at GeneaBloggers. Sam Nunns and Alice Cockerham, my great great grandparents, were from the West Riding of Yorkshire. Sam was born on February 8th, 1874 in Rothwell, to Henry Nunns and Tamar Dickinson.1 Sam became a stone mason. Alice was born on March 9th, 1878 in Oulton, to Alfred Cockerham and Sarah Ann Kemp.2 She worked as a domestic servant. What prompted them to sail to the other side of the world? Whatever the reasons, they sailed aboard the Delphic in 1902 and disemarbarked at Port Chalmers, Dunedin, New Zealand. Also travelling with them was Sam’s brother Charles. A lot of the information I have about the family is from research done by a first cousin twice removed and her husband. They are currently working on a book about the family, so I don’t want to steal their thunder by posting some of the stories on here. Can’t wait to read the book! They also kindly supplied the photo of the family, seen here in a recent Wordless Wednesday post. England, birth certificate for Sam Nunns; 07 Feb 1874, Rothwell; citing Mar 1874 [quarter] Hunslet 9b [vol] 338 [page], General Register Office, Southport. England, birth certificate for Alice Cockerham; 09 Mar 1878, Oulton; citing Jun 1878 [quarter] Hunslet 9b [vol] 349 [page], General Register Office, Southport. England, marriage certificate for Sam Nunns and Alice Cockerham; 11 Jan 1896, Oulton; digital image, from original held by [NAME AND ADDRESS FOR PRIVATE USE]; citing Mar 1896 [quarter] Hunslet 9b [vol] 363 [page], General Register Office, Southport. England, birth certificate for Elsie Nunns; 27 Nov 1896, Rothwell; photocopy, from original held by [NAME AND ADDRESS FOR PRIVATE USE]; citing Mar 1897 [quarter] Hunslet 9b [vol] 303 [page], General Register Office, Southport. [NAME FOR PRIVATE USE], Nunns Family Tree, GEDCOM file supplied 2011. NZ Dept of Internal Affairs, “Birth Search,” database, Births, Deaths & Marriages Historical Records (https://www.bdmhistoricalrecords.dia.govt.nz/search/ : accessed Jun 2011), entries for Gordon Eurwin Nunns (1903/591), Hector Nunns (1905/12247), Hazel Alberta Nunns (1906/22306), Charles Dickenson Nunns (1908/4031), Margaret Annie Gwendoline Nunns (1910/24707). New Zealand, marriage certificate for Alexander Wright and Elsie Nunns; 07 Jun 1917, Napier; citing 1917/3264, Birth, Deaths & Marriages, New Zealand. Part of my summer holiday this year will be spent “oop North”, more specifically West Yorkshire. The Nunns and Cockerhams on the maternal side of my family all come from around the Rothwell area (that I’ve discovered so far in my research), so it makes it easy to base myself in one spot nearby. I’d done almost no work on this side of the family (my great grandmother’s parents), as there are a few family members already doing research, so I’d left it a bit and concentrated on other lines. So when I came to actually compiling a list of addresses, churches, graveyards etc, I realised I had very little! Back to the censuses I went, and it has taken me quite a while to document it all, and I’m still not finished. I’m also ordering certificates that I haven’t got already, so it’s a slow enough process. My great grandmother Elsie Nunns is the only great grandparent that I knew – I was in my late teens when she died. She came out as a child with her parents Sam and Alice Nunns from England to New Zealand around 1902. Sam and Alice went on to have another seven children, and there have been several reunions of their descendents (though I haven’t been able to attend one yet!). Sorting Saturday is an ongoing series at GeneaBloggers.